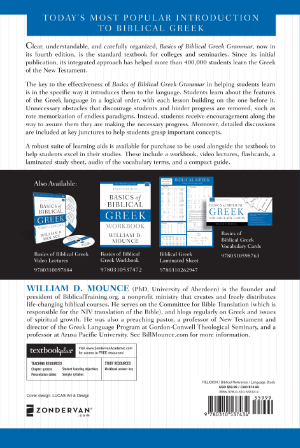 The layout of the book has been simplified. It's gone back to its former size (6 x 9) but with a lay-flat binding. You wouldn't need a brick to hold the pages open. The layout is cleaner, which makes the content less intimidating, and the Professor has been moved to the website. 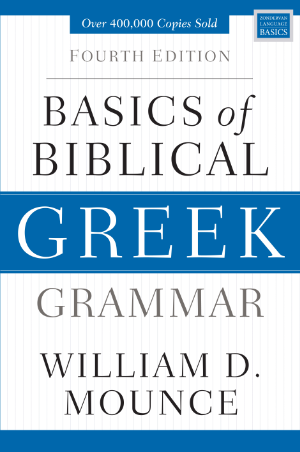 Vocabulary is the same (except ἅγιος is moved forward to chapter 9). However, pay close attention to the semicolons in the vocabulary listings. They identify the different glosses for a word. Exercises 11 and 12, which are made-up sentences, now have space to translate them; hopefully, teachers will start requiring them. A few exercise sentences have been replaced, and the order of the parsing exercises have been re-ordered in later chapters so that they go from easier to harder. Eventually, there will be a listing of those changes. The FlashWorks database, paper flashcards, and the Compact Guide have all been updated to match the changes in the grammar. Roots are added to the cards, and a downloadable PDF listing all the words in alphabetical order is available for free. Scholarship's new understanding of the middle voice has been included, and teachers are invited to decide which approach to use. The same goes for the debate over σα and θη forms. QC codes will point you to YouTube presentations on some of these issues. Aspectual language is now used throughout. So the book talks about the imperfective aspect, imperfect tense, perfective aspect, aorist tense, combinative aspect, and the perfect tense. I always include the words "aspect" and "tense" to avoid confusion. Roots have been emphasized from chapter 4 on, are listed prominently in the vocabulary sessions, so when the student comes to chapter 20 it is natural and easy to think in terms of roots and stems. Click here for a list of the changes made to the fourth edition of the workbook. The English style has been tightened up, made more precise and more readable. The paper is white so the blue highlights stand out better. It is 540 pages long.